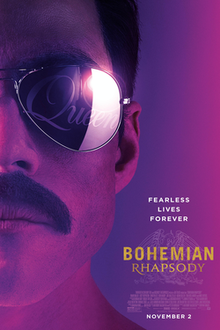 Bohemian Rhapsody brings the story of legendary music group Queen and their center star Freddie Mercury to the big screen. I’ve been a hug fan of Queen and their music for a while, and they have been my favorite music group with their classics such as the titular song being among the best songs of all time. My love for the band explains why I was so excited to watch this film, and I was not let down. Bohemian Rhapsody lives on the promise of a great depiction of the behind-the-scenes of the making of some of your favorite Queen songs, as well as digging into its lead singer who still remains a legend to this day. Rami Malek hasn’t been in many major film roles before but was the perfect choice to play Freddie — he disappears into the role in every moment in an unbelievable transformation which required Malek’s full effort. It feels as if every movement he makes and every word or scene he’s in was perfected to feel like the real Mercury. Also great are Gwylim Lee and Ben Hardy as the other founding members of Queen — whose real life counterparts were musical consultants on the film. Knowing and loving the songs and group that the film is about, audiences will be sure to want to catch this one and be enthralled by how the band came to be or what inspired their greatest hits. Though some that don’t enjoy their music as much will be more keen to notice the formula that a lot of biopics use (“anyone can achieve their dreams” “character pursues their dreams/argues with those close to him/makes amends with them and redeems themselves”) — the film won’t offer much new plot-wise especially if you know more about the real story, but that’s alright. There’s also a few aspects that would have been more entertaining to see in extended sequences rather than being shortened to montages, but the movie already clocks in at 135 minutes anyway. The vivid cinematography and editing kindly boast uproarious musical concert sequences, which are also so enjoyable because of the fact that the songs you love so much are being played to you on the big screen and you can’t help but want to sing along. You may read many different things from critics, but mark my words — any fan of Queen and Mercury will have a blast watching Bohemian Rhapsody on the big screen. Others may notice the familiar plot structure or formula but one thing is for sure — Rami Malek will get serious buzz for his portrayal of Mercury, and watching your favorite songs being created and performed on screen is nothing but a wonderful time on the big screen. This entry was posted in Drama, Musical. Bookmark the permalink.